This lickle light of mine I’m gonna mek it shine him a sing inna di number four tune pon this outstanding album! Listening to it, I man sure bout that light of this man Rob Symeonn is gonna shine even more brighter inna di future fi sure! Like many other artists him a start singin as a youth. His debut single in 1997 called "Anything for Jah", really started it on fi him. Give thanks to Easy star records for recognizing this oh so talented , spiritual, conscious singer/songwriter! This album whas released on the 7th of November (It’s his debut album for Redbud recordings) "THE CHOSEN ONE" and that is what he is, for nobody could a do it better. For with his sweet voice, an empowered lyrics over a classics Roots Reggae filled with heavy Drum an bass. He really created an outstanding album. Raaaspec! Featuring artists pon dis album are Junior Kelly, Willow Wilson, DJ Tempa, Jerry Johnson (who plays a pure, nice an Irie saxophone filed tune) di track number 17 called "Empress." 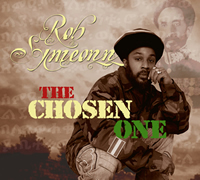 Other tunes on this album The Chosen One are: Message in the Music, Empress, Roots Woman, Best Friend , Good Over Evil, King Tafari, an so much other Irie sweet conciousness! It really mek it an album absolutely not te be missed Album in your collection! Blessed is this bredda that absolutely not walks in the shadow of the ungodly an is Blessed with a whole heap a talent an inspiration!